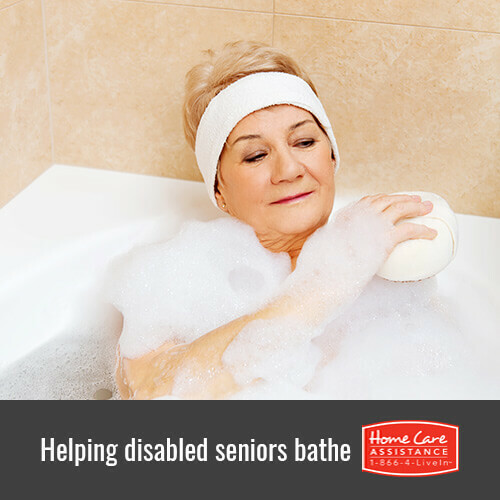 Seniors who have physical and even cognitive disabilities need a lot of assistance with daily activities, particularly when it comes to bathing and showering. If you’re a Rhode Island home caregiver, you can incorporate some of the following ideas to make bath time easier for both you and the senior you care for. When seniors live with immobility or require post-stroke home care in Rhode Island, they may not be able to stand or sit up on their own in the bath or shower. To eliminate any fall hazards, it’s important for seniors to have access to an appropriate chair or bench that can be installed in a shower stall or bathtub. Bath chairs for disabled seniors come with non-slip rubberized tips on the legs to prevent slipping. For maximum traction, the legs of the chairs can be set up over a rubber mat that comes with suction cups for a good grip on the bottom surface of the bathtub or shower. Before a senior citizen is assisted into a bathtub or shower, caregivers should ensure that the chair is set up firmly over a dry mat. Once the elderly person takes a seat on the bath chair, the caregiver should turn on a showerhead with an extended hose. Seniors who have good mobility in their upper bodies should be allowed to slowly shower themselves with such a flexible shower fixture. To make it easy for a senior to get up after bathing, it’s beneficial to have a chair with armrests to provide good leverage. When helping seniors with cognitive disorders bathe, caregivers must pay close attention to hazardous situations involving the bath or shower fixtures. For example, a person with dementia might abruptly turn the faucet to the hottest setting. Elderly individuals with memory problems should not be allowed to turn on or off any of the fixtures in a shower or bathtub. These seniors also have a tendency to get up and rush out of a shower without drying off with a towel. While assisting these seniors in the bathroom, caregivers should ensure that the door is locked and that a few dry towels are readily available. To learn more about caring for physically and cognitively disabled seniors, reach out to Home Care Assistance of Rhode Island. We are a leading home care agency in Rhode Island that enables seniors to live independently while managing injury and disease in the comfort of home. We provide flexible live-in and hourly services to meet each client’s individual needs and schedule. Contact us at (401) 284-0979 for more information regarding our services and schedule a free in-home consultation.